I was talking to family and heard my sister-in-law say she missed seeing her New York hostas. I can understand why. These used to grace crape myrtle trees in her front yard in Virginia, the varigated leaves a nice contrast against the grey crape myrtle trunks. 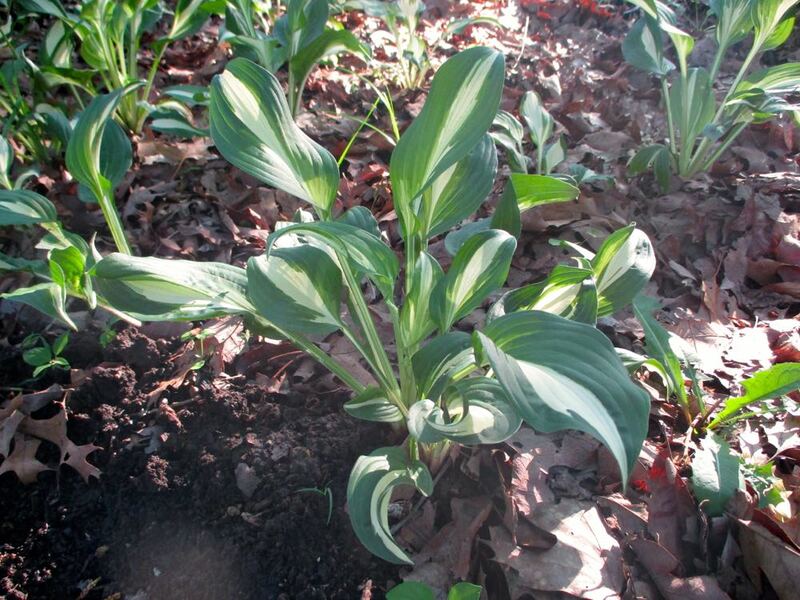 Variegated hostas have white, cream or yellow in their leaves that may look like solid patterns, blotches or stripes. ‘Marginate’ variegation is when variegation occurs on the margin of the hosta’s leaves. ‘Medio variegation’ is when variegation is in the center of the hosta’s leaves. According to the American Hosta Society members' rankings, in 2008 variegated hostas made up 8 of the top 10 and 17 of the top 25 hostas. Turns out the varigated hostas with white centers can be touchy to grow. Without enough sunlight, white-centered hostas lack chlorophyll in the main portion of the leaf. In more sun, the green portion of the leaf can often produce the extra food needed for the hosta to thrive. Some white variegation hostas can tolerate full sun without burning. Generally, a hosta with thicker leaves can tolerate more intense light. White variegated hostas with thin leaves should be restricted to partial shade, bright shade, or early morning or evening sun to look their best. Direct sun exposure is often too intense for the white variegated hostas and may cause them to burn or turn brown, which isn’t harmful but can certainly make the plant unsightly. I don't have all of them, I just hand-carried a dozen or so home when I flew back from a short visit. I also had daffodil bulbs and some crape myrtle starts in hand but the hostas travelled in my carry-on, their leaves waving in the airport as I hopped the flights. When I first planted them in a shady part of my garden, they were bedraggled and looking a bit tired, somewhat akin to being munched on by deer. Deer love to eat hostas so I would not have been surprised to see my visitors nibbled on. So far only rabbits have made a little visit to the flower bed. Here they are now, looking brand new and quite happy on their little Missouri vacation! They will remain in this lovely shady flower bed until my sister-in-law wants them back. I will only be too glad to personally deliver them!